To view examples of available sketch styles, as well as pricing, please visit my Pets-A-Sketch page HERE. If you would like to place an order, please read the following info. All sketch orders are done by email - please send inquiries / orders to artbyrobynmillar@hotmail.com . → Attach the photo(s) you’d like sketched. 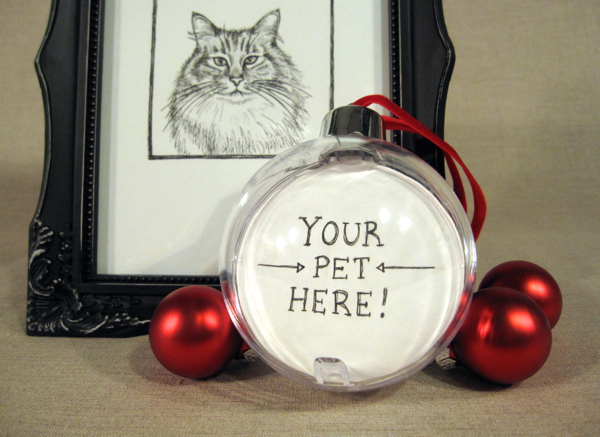 → Indicate the name of each pet being sketched. → Indicate what format of sketch(es) you’d like (5×7 unframed, or ornament). → Indicate what style of sketch(es) you’d like (black & white style, or watercolour accents). → If ordering an ornament, please indicate if you’d like to change the ribbon colour (upgrade is 50⊄ ea). → If shipping is required from Calgary, please provide me with the mailing address that the artwork will be sent to & I can get a shipping quote for you. Email me the above info . Payment is done by e-transfer (sent to artbyrobynmillar@hotmail.com) when placing the order. We coordinate shipping, or the pick up date/time. And then the artwork is all yours, yay! For questions or clarification on anything listed above – please feel free to contact me via my website, email, or social media.